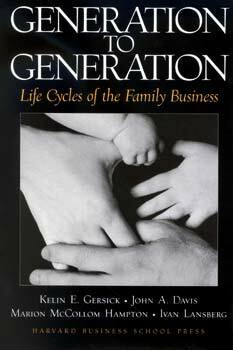 Considered the most authoritative work on family business, Generation to Generation offers readers a holistic understanding of the complexities of family-owned businesses, and how to manage their unique challenges. It is conceptually rich and brimming with pragmatic recommendations from the authors alongside stories of family businesses around the world. A comprehensive range of topics are presented, including family dynamics and emotions, competing interests, work relationships, governance, ownership, management, succession, traditions and change, and many more. Based on decades of research and consulting with hundreds of family businesses around the world, the authors—who are among the earliest experts in the family business field—present original developmental models of the evolution of family companies. The Three-Circle Model (Tagiuri and Davis) is applied as a useful analytical tool to explain the success factors and vulnerabilities of family companies. In addition, frameworks for understanding family work relationships, succession, ownership, and businesses are used. The authors weave together practical recommendations for the survival of family companies with stories of particular family businesses worldwide. Their lessons illustrate how family businesses often work and how to professionalize them, how family companies should be organized, how issues such as succession should be managed, the role consultants can play in facilitating transitions in family companies, and other essential topics. Generation to Generation is widely considered the most profound contribution to the study and understanding of family businesses. It is a touchstone for all family members and non-family employees who are involved in family businesses and for the non-family professionals who serve them.